An important aspect of climbing any mountain in our life…is prayer! Communing with God and leaning on God’s guidance can not only get us up the mountain, but can also give us new perspective. I have found prayer a theme in my life lately. What I mean is that, I have been drawn to prayer in new ways. The first book that I have begun reading in 2019 is C. S. Lewis’ Reflections & Essays on How to Pray. I have engaged in a personal prayer journal for the new year. In small group conversations we have chatted about prayer together. I have found myself praying in the middle of the night while sitting up with a playful two year old…please grant us rest. I have also found joy in prayer as I listen to that same two year old learning to say her own prayers. Our prayer over dinner last night with our heads bowed and hands together was “Dear God, Happy Birthday Jesus. Amen.” It has brought such a light in our home to hear a child begin to talk to God. Prayer is communion with God. It is a matter of making connections with the One who stands at the center of all life and joy, and of learning to live with those connections all the time. 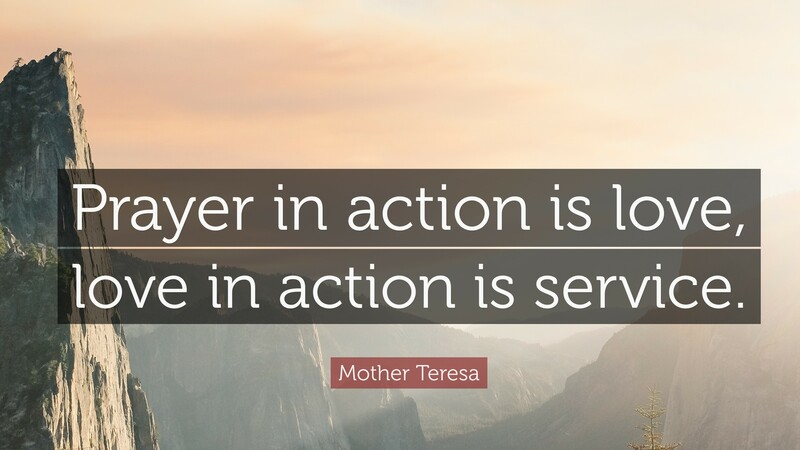 For me, prayer is an act of faith. Prayer is our way of expressing our faith and trust to God. And so, I believe that prayer, also, without works is not helpful. As James says, if we know of someone who has a need, out of love we help. Our prayers for them lead us to help meet their needs. Our prayers, our faith, call us to action. When we truly commune with God, we join with God in God’s work in the world. May our prayers truly move us, change us, make us whole. Amen.